This is a great family meal, perfect for those informal occasions. Heat a large wide based pan with a little oil, add in the diced onion and garlic and soften for 2-3 minutes. Add in the beef and chilli powder and cook for a further 6-7 minutes until the beef is browned off. Add the chopped tomatoes, kidney beans (if using) and beef stock. Continue to simmer over a low heat for 15-20 minutes before mixing in half the yogurt, which will give you a nice creamy consistency. 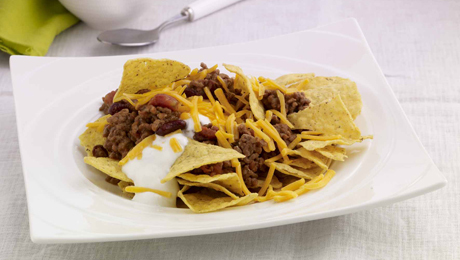 Arrange tortilla chips in each serving bowl, spoon over some of the minced beef mixture, top with yogurt and sprinkle with grated cheese. Kevin recommends 1 level teaspoon of chilli powder but if you want it very spicy feel free to add more. It does not say how much chilli powder to use!